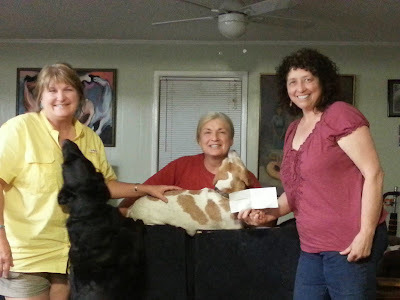 what a wonderful person - and a fabulous friend to us animals! YAY! I am very impressed by all the amazing work done for the animals (cats, dogs and horses). Bone to be Wild sounds like a great book. I am looking forward to reading it. Thank you for the giveaway. Paws up for running a rescue! How on earth does anyone find time to run a rescue and write, too? That's double-pawesome. Fabulous that you have a rescue farm, Carolyn. Stories like this warm my heart. I'm not quite an angel--ask my friends. I devil them all the time. It's true that I don't have the time to think up practical jokes like I used to--cleaning stalls, bathing animals, working tirelessly to instruct the cats in the mere basics of kitty etiquette! These things take time, and for the most part are futile. Especially working with the cats. They pretend to pay attention and then do whatever they like. Cats! All of my Sarah Booth books feature Sweetie Pie, the hound, and Pluto the black cat comes in at BONEFIRE. And Roscoe makes an appearance in BONES OF A FEATHER. There are also horses in the stories. I read them aloud to my gang in an effort to show them they, too, could be gainfully employed. It doesn't work at all. I, too, thought about being a vet because I love animals so much. But I realized that I can't stand to see them in trouble or pain. Not good for a vet. I give you great credit for having your refuge! What a labor of love. Lucky animals. A few years ago my niece rescued a mare. She couldn't seem to get her to fill out despite the good care she was giving. Then one morning she went out an found a beautiful baby boy with the mare! Turns out they are 100% Morgan. Not that she needed 2 more horses, but shat a jackpot! Carolyn is a true animal advocate! What a tremendous and wonderful person! What an amazing person!! How does she find time to write?? I admire people that do animal rescue work so much. I'd love to do it---and I have the room---but my hubby says "NO" when I want to get another animal. I only have 2 dogs and 2 cats and I just love them to pieces. Animals can truly be part of the family. Thanks for the interview---I would love to win your book. All of my cats have been rescues. Thank you for all the good work you do for animals and thank you for such a great series!! We animal lovers have to stick together. I really enjoy being able to use the animals (based on my own animals) in my books. Right now I have 4 hounds and 4 other dogs--it is a wild and hairy place. And the 9 cats and 5 horses. Whew. I do stay busy. But I feel this is my mission. Thank you for your kind words. We're very impressed with Miss Carolyn. Paws up to her and her rescue! Great interview, 4 paws up from my kitties. Hugs to Carolyn for her work. I hit preview and it disappeared? anyone know why? Well I am going to try again. I have read all of the books thus far and love each of them. If you haven't already read the first 14, What are you waiting for? You are in for a treat. This is a great way to take a vacation to the deep south without every leaving home. These books will delight, intrigue, make you laugh, and hook you for life. Buy this one asap, and then grab as many as you can find on line. I enjoy reading them and then re-reading them they are so good. You will have the perfect summer read with any of the Sarah Booth Delaney series books. You will be enchanted, you will be intrigued, you will find yourself laughing out loud, you will be on pins and needles unable to put the book down, and finally you will be relieved when Sarah successfully solves the 'who done it' without being mortally wounded. You will fall in love with Sarah and her entourage. There will be times when they have you laughing, times when you are in tears, and then times when you are hopping mad at Coleman, or Graf. You will come to consider reading these books as a visit with old friends, like flying home once a year and getting reacquainted with those back home. Whether you are looking for something to read on the beach, relaxing in your back yard, or in the comfort of your home you will be glad you bought this book. Perfect for that subway commute to work, waiting to catch a bus, train or plane. Great for reading on that flight to your vacation destination or that business meeting that is giving you ulcers. Set a spell and enjoy Suthin' hospitality, intrigue, romance, mayhem, and mystery. Definitely a book you will enjoy reading and not want to put down, but then want to re-read slowly, to savor the ambiance, the camaraderie, and wordsmith-ship of Carolyn Haines. Welcome to the world of Sarah Booth Delaney, I know you will enjoy these delightful, entertaining and addictive of Mississippi Delta mysteries written by an award winning author whose love for and knowledge of the South is obvious. My apolgies for the few errors in my comment above but after hitting preview and it disappearing the first time I just hit publish. All the best and I am excited for those of you new to this series. The book sounds like a real fun and interesting mystery. I would love to read it. Thanks for having the giveaway. another author to add to mom's reading list....can't wait! 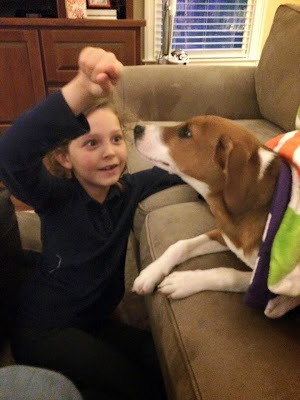 What a great post, I liked learning about Carolyn's love of animals! And, I'm looking forward to Sarah's new adventure. Thanks! My kitty boy thanks you for your spay/neuter work to help control the unwanted animal population and your animal rescue work.